Georgine Saves » Blog Archive » Good Deal: Genuine Quartz Adjustable”Bolo” Bracelet in Sterling Silver $39 + Ships FREE! TODAY ONLY! Good Deal: Genuine Quartz Adjustable”Bolo” Bracelet in Sterling Silver $39 + Ships FREE! TODAY ONLY! 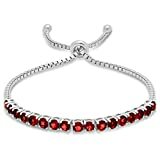 #ad Today only, 2-07-19, this genuine Quartz adjustable Bolo bracelet in Sterling Silver for $39.00 (regular price $60.00) at Amazon.com is perfect for a Valentine’s Day gift. It comes in your choice from 3 quartz colors and shipping is FREE.